By Caz | February 16, 2019 | This post may contain affiliate links, which means we may receive a small commission, at no cost to you, if you make a purchase through a link. Read our Disclosure. We get inundated with emails and questions asking how someone can travel around the world, especially since they are drowning in debt, have little money, or just graduated from University. 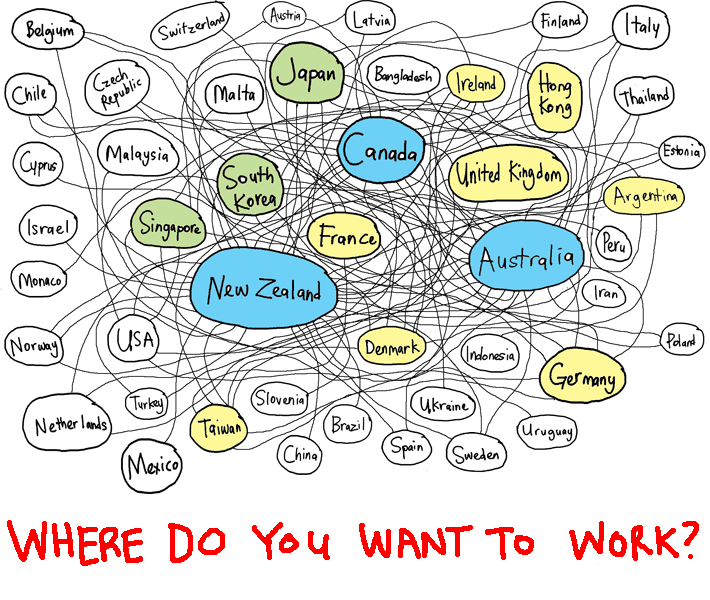 Our first suggestion is to work abroad! I first left to travel in 1997, three days after I graduated from University and with very little money. After a 3-month backpacking trip through Indonesia, I arrived in London with no money, no job, no place to stay, and no friends. I stayed there for 2 and a half years. Since then Craig and I have lived in Dublin, Bangkok, the USA and many parts of Australia. We did it with very little money saved and debt by way of good debt – mortgages that tenants covered – and bad as well. We’re also utilized the same concept by road tripping Australia with our 2 daughters – one of the most expensive countries in the world. Little money saved, but we’re working online to cover our costs and turn every day into a play day. It’s the BEST strategy to live a life of travel and experience different cultures. Most of us have to work for a living and we need money to travel. Why not combine work and travel? You don’t have to save up as much money before leaving home. You’ll be earning local currency. You experience a culture deeply by working, living, traveling within it. Weekends and days off become adventures. You’ll travel more like the locals, which usually makes it cheaper. You form deeper friendships and connections with people. You’ll learn new career skills and processes. You may get perks such as free accommodation, meals or even flights. As I am a qualified primary school teacher, teaching for me was a fantastic opportunity to work and travel around the world. Everywhere needs teachers, right? I taught in London for 2 years. I had a few long-term part-time positions and then worked on a casual teaching basis. I wanted this flexibility so I could travel when I wanted, rather than be tied down to school holidays. Pay: Around 100 pounds a day. (Would be more now) I did not get sick or holiday pay. How I got work: I interviewed with an agency in Sydney before leaving Australia. When I arrived in London, I met with my case manager who then worked to find suitable jobs for me. I started casual teaching and then worked full-time as a resource teacher in a Pre-School – year 2 school. I taught small groups of children English as a Foreign Language and the Irish minority children. Pay: 140 Euros a day. How I got the job: I initially worked through a teaching agency and then applied for the advertised position in the paper. As it was not for a classroom teacher, I did not have to speak gaelic so was allowed to take the job. It is hard to get a job teaching full time in Ireland because of the Gaelic speaking requirement. 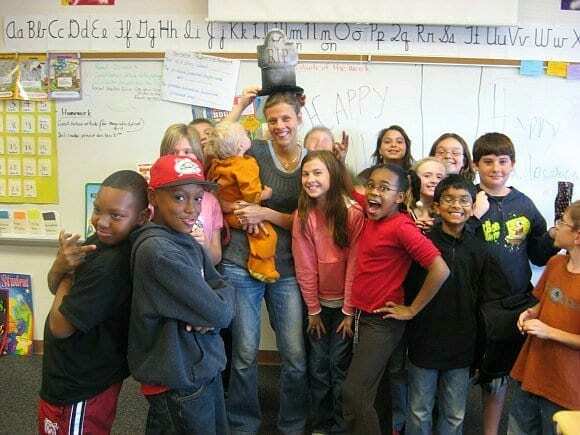 I taught Year 5 (Grade 5) for four years at two different schools in Raleigh, North Carolina. Pay: Low, by world standards, I earned around $36,000 a year, but the cost of living in North Carolina is very affordable. How I got the job: Through the VIF program, who recruit teachers from around the world to teach in the US. I found the ad in a Teacher’s Union magazine in Dublin. Applied. Had a phone interview in Dublin, an in-person interview in Cape Town and Sydney. I was placed in North Carolina. Travel Experiences: Road trip southeast USA, road trip from east to west coast, Puerto Rico, New York, Chicago. In 2006, we left to travel China and South East Asia. Teaching English overseas is a great strategy. We both taught English in Bangkok for 6 months. I taught at an all boys high school and Craig taught at one of the best high schools in Thailand. I also taught at a private language school on Saturdays for 6 hours. Pay: I received $500 a month. Craig $760. We had free accommodation within the school. At the private language school, I received $250 a day. How I got the job: I applied for a teaching program via an ad in the Sydney newspaper. After a dinner meeting the other participants, and our teaching mentors at our schools, Craig had a conversation with a mentor from another school. The next day he had a job teaching at the best high school in Thailand, Triam Udom Suksa. For the private teaching job, I applied to an advertisement in the Bangkok newspaper. Pay: I think it was around 70 euros a day. How I got the job: I did a TEFL course in Dublin and then applied for summer teaching work through a newspaper ad. Travel Experiences: As above + part of the job meant taking the students on excursions to tourist attractions in Dublin and surrounds. I did some casual bar work at various bars around London. I worked for an agency so they placed me in various bars and functions that needed bar staff for the evening. For the last 6 months, I worked permanently at a pub near St James Park. Pay: Eek! I can’t remember this, but it was award wage at the time. It brought me around an extra $150 a week. How I got the job: I joined a bar agency that was advertised in the TNT Magazine. I had a short interview and then they phoned me each week with possible assignments. Travel Experiences: As above + working in bars all over London helped have a diverse London experience and discover new places. I worked in Dublin for the summer of 1999 with my best friend Bec. It was rad! I worked at a small pub just off Grafton St for the lunch time shift. In the evenings I worked as a waitress in the ever popular Oliver St John Gogarty’s in the busy Temple Bar District. This was one of the funnest working holiday experiences I had. Bec and I were in the thick of the party scene. We quickly made good friends and enjoyed the craic immensely. Pay: I cannot remember how much I was paid by the hour. I think in total I made around 400 euros a week, but I got free meals at both pubs AND I received killer tips at Gogarty’s – sometimes 100 euro a night, mostly 30 euro average. How I got the job: At my day time pub, I walked in the day after I arrived and introduced myself to Mickey. I’d heard a lot about him as my brother once worked at the pub. Mickey managed to find a day shift for me and started me the next day. For Oliver St John Gogarty’s, I walked in and asked if they had any jobs available. I started that evening in the bar. It was so busy and very aggressive with testosterone. I did not get on with my manger, who hated the way I poured Guinness. He sent me upstairs to help in the restaurant, which I loved. I begged the manager to put me on full-time and she did. Bec joined me a couple of weeks later. I LOVED working there. Travel Experiences: Temple Bar pub crawling, wine bars, and a few nightclubs. Craig is a qualified Carpenter, and being a portable skill was fortunate to find work around the world. Craig worked for 12 months in Dublin. For half the year he worked with the maintenance team at the Westin Hotel in downtown Dublin near the Liffey River. It was easy work indoors in a great location. The other half of the year he worked just outside of Dublin building a new Intel plant. Pay: 900+ euros per week plus free travel money. We had the exciting job of chipping barnacles off pearl shells in a remote location in the Kimberley Region of Western Australia. We had to catch a sea plane to the farm and would stay on site for anything from 2-5 weeks. We worked every day from 4am to 3pm. It was hard work, but was a travel experience in itself as the area was stunning – many tourists would spend $1,000 a day just to visit by boat. Pay: After a 5 week swing, we’d walk out with almost $10,000. Accommodation and all meals were provided. How we got the job: My brother worked at Kuri Bay and put a good word in for us. We still had to register at the employment agency Extraman, do the physical and medical tests and go on a waiting list. 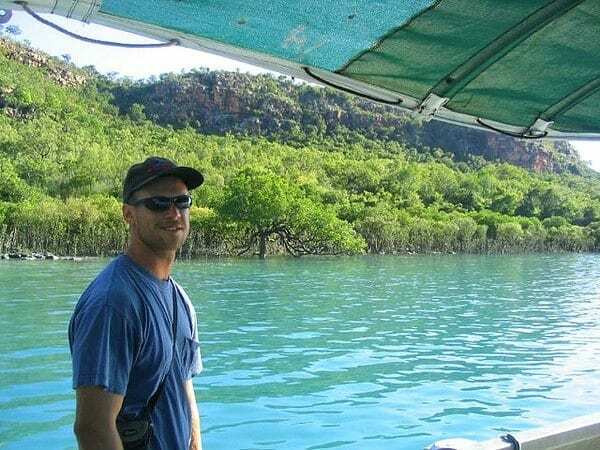 We were so lucky and had someone call in sick so made the next flight out to Kuri Bay and stayed for the next 4 months. Travel Experiences: Camping trips in the Kimberley, Perth. Before I started teaching, I tried my hand at door knocking. We were selling various packages like Domino Pizza vouchers. I’d start early afternoon and not return until around 9pm. I hated it and was ridiculously bad. I lasted 3 weeks. I also worked in a call centre selling envelopes for about 3 days until I worked out it was not for me. Pay: Commission based. I think I earned $9. Craig worked for Delta as a ramp supervisor for 18 months. It was freezing in the winter, and hot in the summer. Terrible money but interesting to learn about an airports operation, and we got free flights on standby, including a free flight home all the way to Sydney. Pay: $12 per hour plus free flights on standby. How he got the job: Craigslist.org advertisement. Don’t forget to research what sort of tax you will be liable to pay and if you are entitled to receive any back. A lot of people overpay tax without realising it. You could be due tax back if you worked abroad or were taxed incorrectly or perhaps didn’t work for the full year. TaxBack.com can check out your details and tell you for free what you’re owed. They provide tax refunds for 16 countries worldwide including Ireland, the US, Australia, Canada and New Zealand. We now have Australia’s biggest travel blog and one of the world’s most popular. We’ve traveled a lot because of it in the past 4 years. We’re so happy we’ve finally found a way to continue the life of travel we love, but without needing a boss or a work visa. It’s all on our terms now. How we make money: We earn money travel blogging via multiple streams – our ebook, freelance content creation, my weekly column at Kidspot, advertising, sponsored posts, and working on social media campaigns. We also get a lot of our travel costs covered, which reduces our expenses. We don’t consider this as free travel, as we work for many hours producing content in exchange. If you are interested in learning how to travel blog, click here. How we got the job: Had a dream. Committed to it. Learned about it. Took action steps daily. Hit it hard with passion fuelled intensity. Networked. And reached so far outside our comfort zone we walked into other stratospheres. Travel Experiences: Thailand, New Zealand, Mexico, Pacific Islands, Malaysia, Hong Kong, Dubai, cruises, several states in Australia and now an indefinite road trip around Oz. Want more tips about working holidays? Have you considered a working holiday? You will have a great time Bianca. Just put yourself out there!! So lovely to see you all living your dream, I know it hasn’t come easily, that you’ve been brave to try new things, resilient enough to overcome challenges and most of all you have put in the hard yards. Congrats to you! I love sharing your journey via this blog! LOVE this post, guys! So much helpful info and advice. I can’t wait to share it with my community — they’re going to eat it up! Hi Susan. Thanks for sharing. We’ve had some fun experiences! Local currency is key! It makes everything so much easier. Having portable skills will always help. This is a great article. I work in education as well and, on a recent trip to Cook Islands, visited four schools. I would have loved to work there, but my teenager would have ended up in New Zealand for her education. Maybe in four years when she’s at university. Sounds like a good plan Carey! Go for it then! Wow! This is a brilliant post and an inspiring one. I am from Namibia. I applied for scholarship to complete a masters at UNSW but if that doesn’t come through for me I am definitely doing this. Thanks for sharing I find your writing very inspiring and am eternally thankful for stumbling on this blog. Much love. Good luck with the scholarship Valerie. I’m not familiar with this blog What are you actually saying with the following? “We also get a lot of our travel costs covered, which reduces our expenses. We don’t consider this as free travel, as we work for many hours producing content in exchange.” Are you saying you don’t pay your own way? That you get freebies in exchange for writing up what your sponsor wants readers to see? (But all opinions are your own etc.) Or what?? IT says what it says Regina. We get costs covered so we can share our experiences of a certain place. And it’s only for about 10% of what we do. We disclaim everything and we only do this for high quality experiences that we can stand behind. They are not freebies, and we only do it for certain things. If you don’t like it leave. We put a ton of effort in to this blog and give a massive amount of inspiration and information to help people travel more. If you can’t see the value in that we certainly don’t want you reading our blog. I wouldn’t bother reading any travel magazine or newspaper either as journalists get ALL of their costs covered and they rarely disclaim anything. It did indeed take a lot of hard work and dedication to get to where you are today; you are truly inspiring to me and I thank you! Thank you Barbara! We appreciate you. As a mother willing to trael, how do you mnage all this with your kids? We’ll be writing lots of posts over the next year sharing all our tips and advice. Is there anything in particular you would like us to write about? Hi Caz, I’ve been following your blog for about 18 months now and it never fails to inspire me. I’ve been following my travel dreams for the last few years (I’m 25) mainly through teaching English and travelling in between countries and taking short trips as well as exploring the country I’m living in. I agree that it’s a really meaningful and affordable way to travel. I’m currently living in Ho Chi Minh City working (actually right now i’m in Cambodia enjoying a short break) teacghing English and saving up to spend 4 months travelling in SE Asia when I finish my year long contract un August. You and Craig are 2 of the bravest people i’ve come across. Keep living the dream and inspiring others! Thank you Rachael! That’s so lovely to hear. Thankyou for sharing your experiences it gets me really inspired. Awesome post, guys! I love it when bloggers share how they make money while traveling. There’s a lot of info how to travel more cheaply, but the other side of the coin is often ignored. It hard tio work full time and have a blog – so be much better to be blogging full time! Thanks for doing such an informative post! 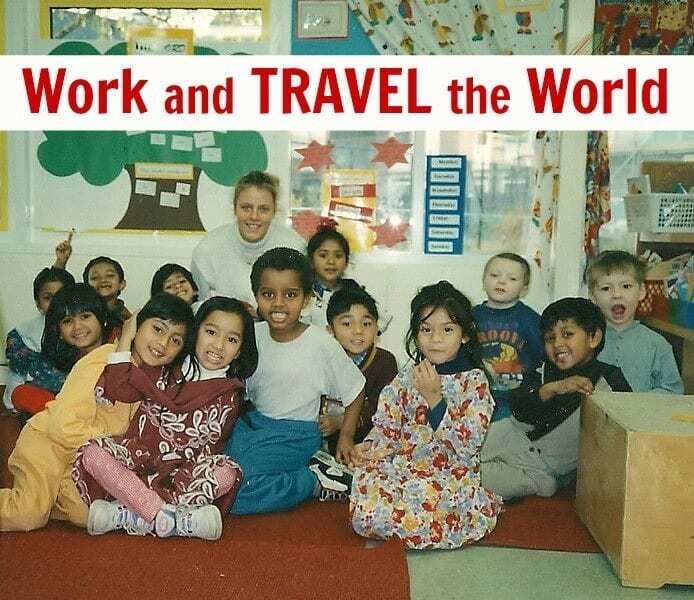 Teaching seems to be the perfect skill to have as a traveler. I might look into TEFL when I go back to Ireland, I never considered doing it at home. Great post! It’s nice to see in writing how hard you have worked to make your travel happen for you. I have always been a believer in work and travel (and still am). It’s a great way to fund your experiences and get to properly discover the places where you are travelling. You guys have done it all! I imagine the upsides to working whilst travelling (besides the money) is meeting local people and really getting to see another side to the country. Do you miss the teaching/bar/airport etc jobs, in terms of working with the locals? Thanks for such great info! Yes sometimes this is a downside to having your own business. But, being in the travel industry we still do have a lot of involvement with local businesses. And cause we’re in Oz now and are Australian, it doesn’t bother us so much as we already understand the local culture! As mystifying as online business is to some readers, just take an hour a night learning how you can freelance, be it through your writing, graphics work, coding, etc. Meet people online through their blogs, Twitter and Facebook and get to know them. Mention that you have skills that you can help them with (if need be), and be willing to work for free at first. After a while, propose to start charging them for the value you provide, continuing to network all the while. This is how I’ve built up a freelance writing business that has the minimum effective load to pay for my travels around the world. Inspiring. Came here through a link from one of your recent stories. A lot of hard work gone in there. Great to read this. A very inspiring post – I thought travelling was way out of my budget, but you’ve smashed that untruth out the park! I think I might start thinking where I’d like to go most…. or first…. what a wonderful life. this is the life i been hoping for all this time. I’m searching for other revenue streams when I try and move to japan on an investor visa. This is certainly interesting stuff. Sounds like a lot harder work than I might be willing to do chipping barnacles. Great! My husband and I are moving to Thailand for 1 year and I’m so happy to have found your informative and insightful post. This is almost like a revelation. Most of us are stuck in a 9-to-6 job. We get the weekends off, which we utilize in local joints in city itself. To travel at such a scale and make a living out of it is just unbelievable. I am truly inspired by your passion for travelling. Thanks. I have been travelling for 9 months now and am concerned about running out of money. I do not want to head back to a depressing and unsafe country. I am stressing myself on how to prolong my freedom I am experiencing through travel.